After the long break the time had finally come for the 2019 racing season to get going. 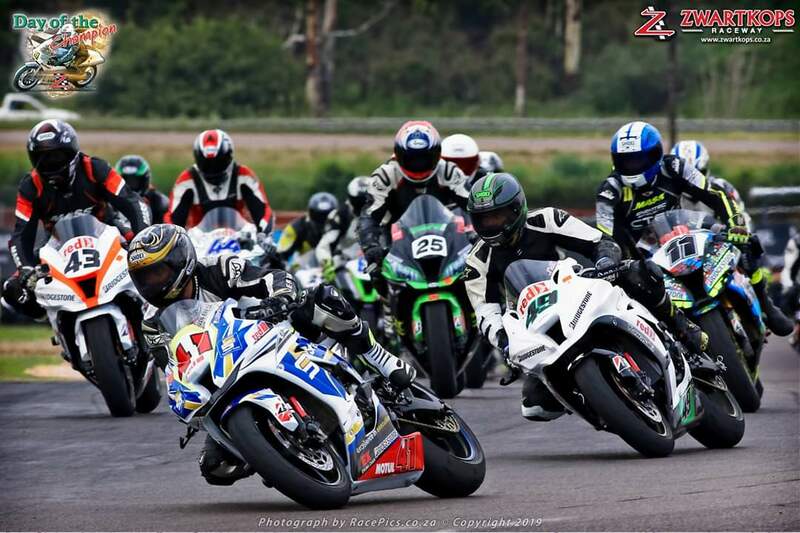 The all-bike “Day of the Champion” race day traditionally kicks off the Zwartkops racing categories, and 2019 was no different. Official practice was scheduled on the Thursday morning leading up to the weekend, where a strong field of riders turned up to the circuit to test the track conditions, following the recent track resurfacing in the off-season. More importantly, the practice allowed for some much needed track time on the new Bridgestone R11 tyres, which are now the newly allocated tyres for the series. Due to a few unfortunate, and unforeseen, circumstances I was a non-contender for this round and setup camp on the grandstand for the season opener. 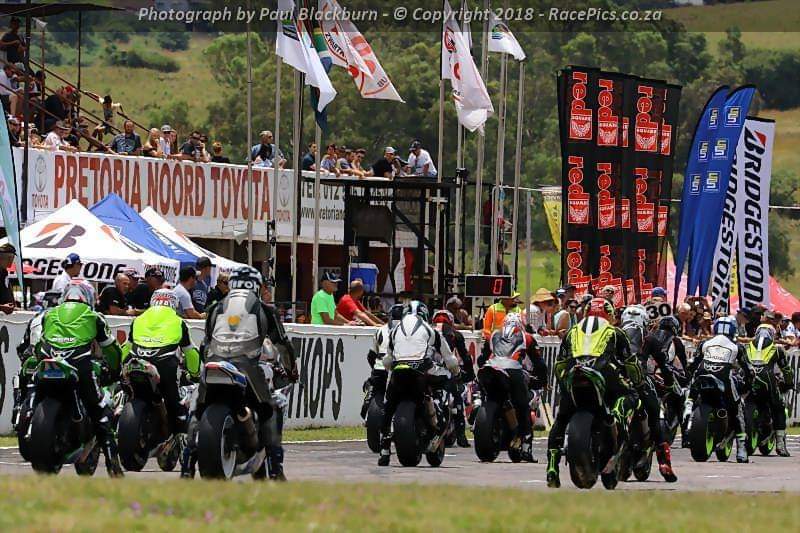 The track conditions had kicked up quite a bit of concern for the two-wheeled racers leading up to the weekend and news of a bit of oil on the circuit dropped by some of the classic cars, which raced on the Saturday, seemed to create added tension in pit lane. The series organisers were however quick to spring into action with a thorough “clean up” operation just before the ZX10 qualifying got underway. Twenty two Kawi’s lined up in pitlane ready for action, with the aim of getting as close to the starting line as possible. The field initially took their time, sussing out the track and scrubbing in their Bridgestone tyres before making the final push for the fastest lap. 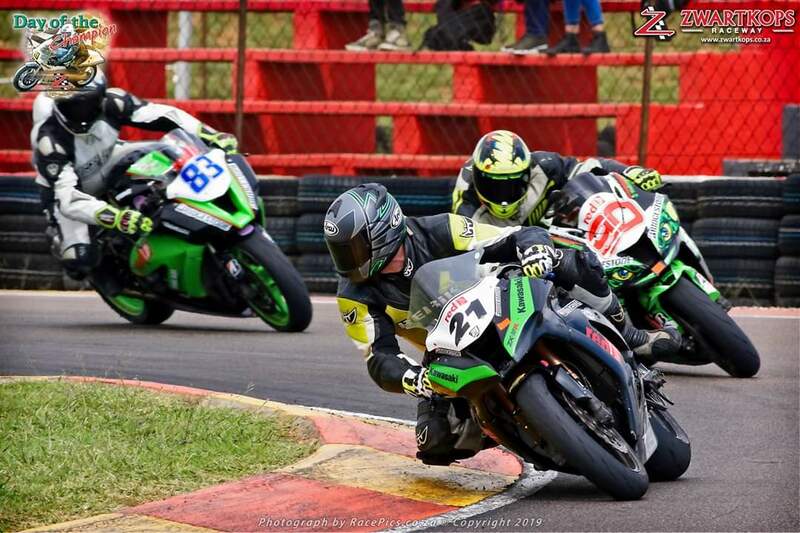 Graeme van Breda was the man to watch putting his Stefanutti Stocks machine on pole position, Gareth Bezuidenhout took second place narrowly missing the fastest lap by 0.18 seconds and Michael Smit completed the front row. 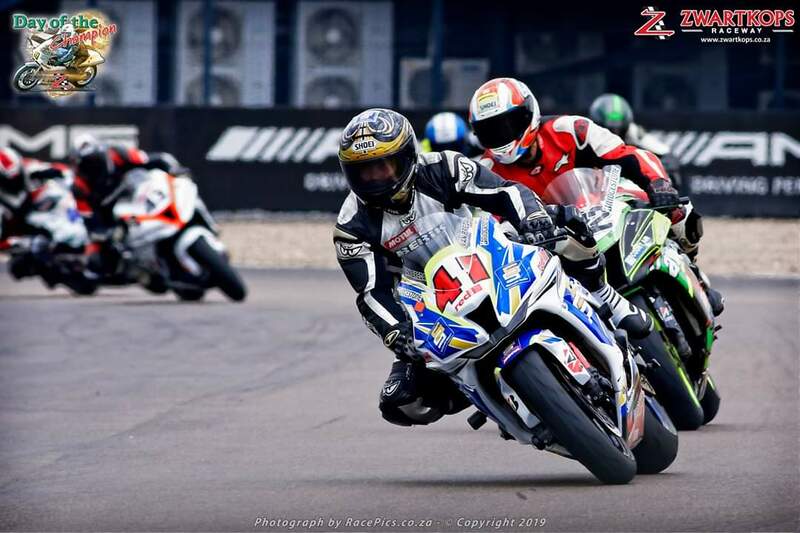 Jonty Collard, Jaco Gouws and Appanna Gunapathy headed up the second row ahead of seasoned ZX10 racers Teddy Brooke, Johan Le Roux and Greg Bezuidenhout. Fresh face Morne Potgieter took the final top 10 spot whilst Sifiso Themba was in the mix in 15th place and Ruan Oberholster in 20th. Twenty one Kawasaki ZX10R’s left pitlane making their way around the 2.4km Zwartkops circuit trying to get as much heat into their Bridgestones as possible before lining up on the grid in their allocated positions. The field absolutely roared through turn 1 at tremendous pace. Race favourite Graeme van Breda hit the front early and looked extremely aggressive ahead of the 20-strong field who jostled for position in the opening laps. Gareth Bezuidenhout got a magic start and looked to keep van Breda honest in the early stages. 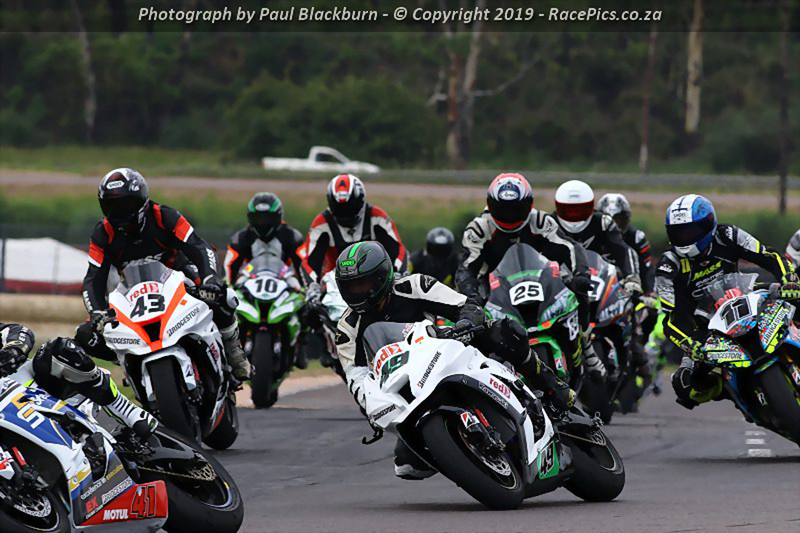 New comers to the series, Morne Potgieter and Gareth Jackson settled into the pace very quickly and battled hard with the likes of series regulars Apanna Gunapathy, Andre van Vollenstee and Jacques Ackerman. On lap 4 Gareth Bezuidenhout disappeared from the timing screens and was out of the race, seemed that he had picked up a technical issue which ended his race early, it was a great pity as the race was really building up to a grand stand finish. 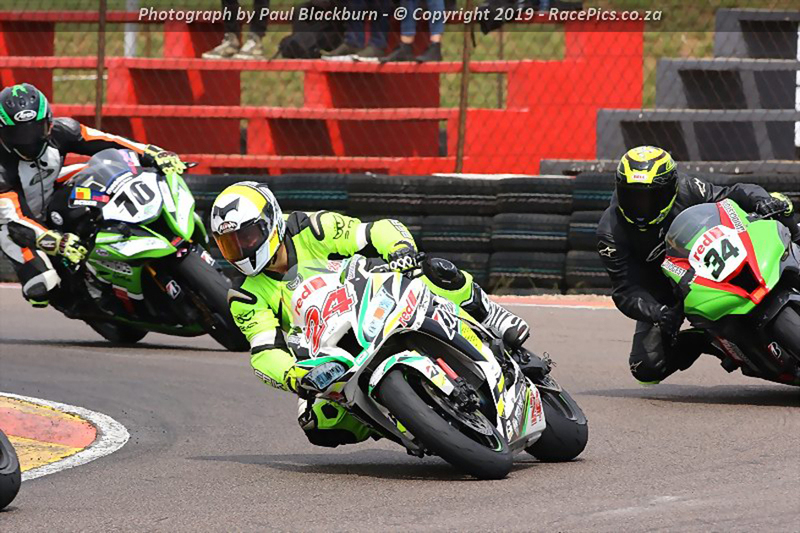 Van Breda brought his Stefanutti Stocks ZX10R comfortably home to take the race 1 win ahead of Jonty Collard in a solid 2nd place with Michael Smit completing the podium. Gunapathy took the top 5 spot with Stewie Christie taking the top ten place. Petrus Lafras Fritz just missed out on a top 15 finish but definitely won the biggest battle on track with McLachlan, Oberholster and Ian Harwood. Last dance of the weekend!! 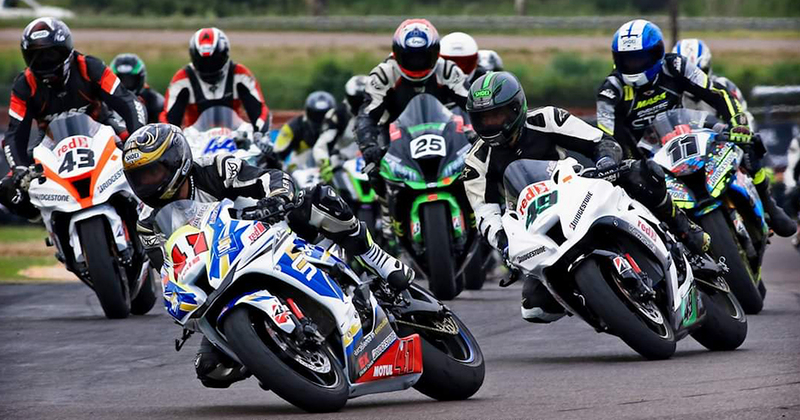 The all Kawasaki grid looked racey and ready for battle. Twenty ZX10’s lined up on the grid and waited for the signal. The second heat was on! 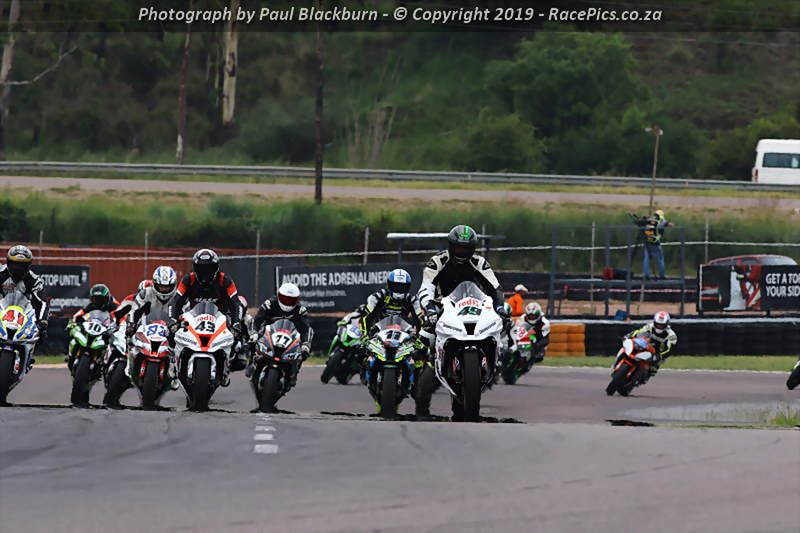 Graeme van Breda led the field out of turn 4 and had already managed to pull two bike lengths on the chasing pack. 3 laps in and the race pace had really heated up as the pack had started to come to terms with the new R11 Bridgestone tyres. The pace was evident by the speed that Sifiso Themba travelled through the kitty litter and into the tyre wall at turn 4, luckily walking away without any injury. Up into turn 5, Gareth “Action” Jackson also decided to explore more of what Zwartkops had on offer by running onto the gravel. Luckily for Jackson the red flag came out for the Themba crash, which put him back on the grid in the track position the lap before. Van Breda had to do it all again after clocking out in the early stages. Nineteen bikes back on the grid….Lights on….Lights off…. 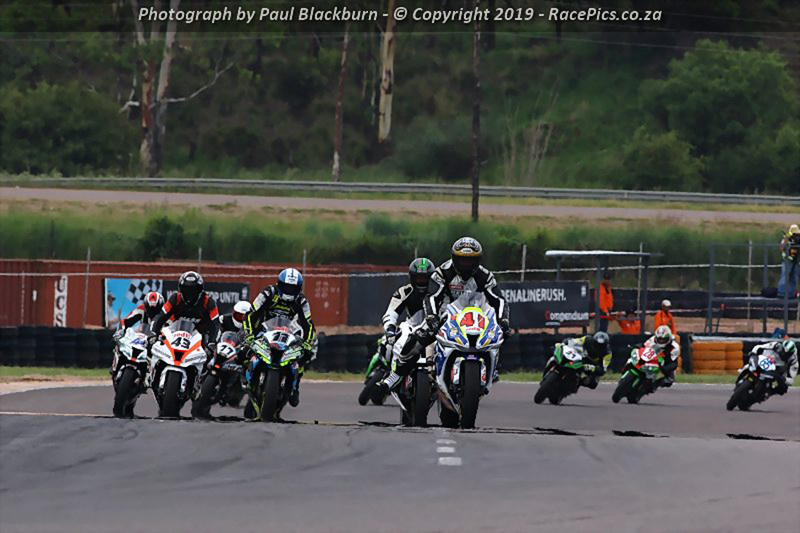 Race 2 was on……again and Van Breda had hit the front early. Up into 5 there were ZX10’s everywhere all looking for the fastest line through the turn. Van Breda cleared off again at the front leaving Collard, Smit, Gouws and Le Roux to battle each other tooth-and-nail for the final podium positions. With 2 laps left to go of the day’s final race, the red flag made yet another appearance to bring the proceedings to a halt. Stuart Russel had gone down at the exit of turn 6 in a massive high side. I was actually amazed that he managed to get up and walk after such a horrific crash. The race was classified as complete with enough laps being ridden in order for the results to be official. Graeme van Breda took the overall win for the day after 2 convincing wins in both heats. Jonty Collard and Michael Smit completed the podium ahead of Jaco Gous and Johan Le Roux. Unfortunately Morne Potgieter was hit with a 30 second penalty for a jump start which pushed him down to 15th place. 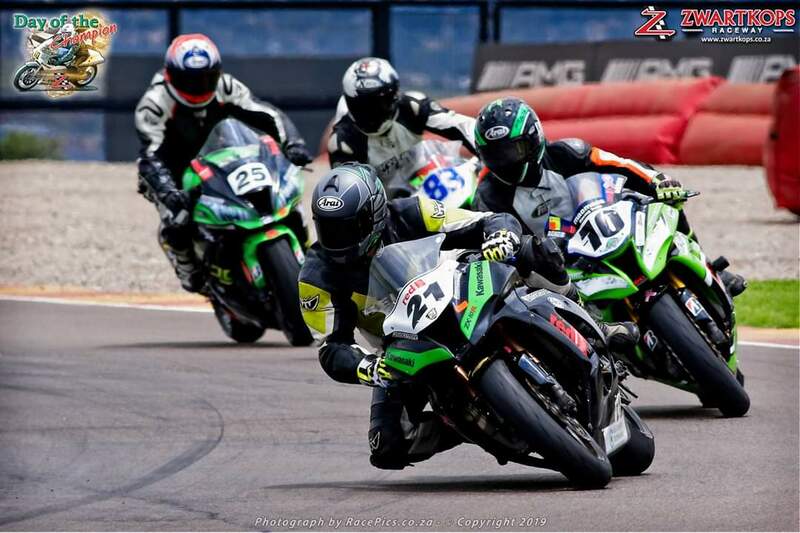 The “Green Machines” are back in action again at “The Big Z” on the 9th of March for the 2nd round of the Red Square Kawasaki Masters Cup. I have finally been able to get my hands on my very own Kawasaki and I am looking forward to making my series debut against these racing savages. Hope to see you all trackside at the next one! A big thanks to Racepics.co.za for bringing my story to life!